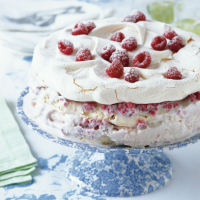 This stunning frozen dessert combines layers of crisp meringue with summer fruit sorbet, clotted cream ice cream and fresh raspberries. Preheat the oven to 140°C, gas mark 1. Line 3 separate, lightly greased baking trays with baking parchment and draw a 20cm-diameter circle on the middle of each piece of parchment. Whisk the egg whites until stiff. Gradually whisk in the sugar, 2 tablespoons at a time, until stiff, thick and glossy, then fold in the vanilla extract. Divide the mixture between the 3 circles and spread flat, leaving a 2cm gap around the edge of each circle to allow for spreading. Cook for 1 hour, or until crisp. Leave to cool. Remove the sorbet and ice cream from the freezer 15 minutes before needed, to allow them to soften. Remove the meringue discs from the baking parchment. Set 1 disc in the base of a 20cm round springform cake tin (if necessary, trim the edges). Place the sorbet in a bowl, stir slightly then spread over the meringue. Place 1 of the remaining meringues on top. Place the ice cream in a bowl and fold in half the raspberries and the liqueur, crushing the fruit. Spread over the meringue, then top with the third meringue. Cover with clingfilm and freeze for at least 6 hours. To serve, remove from the tin and place the gâteau on a plate. Scatter with the remaining raspberries and dust with icing sugar. Leave the meringue to stand for 5 minutes to soften slightly, then cut into slices and serve. This rich, fruity gâteau calls for a lusciously sweet but tangy dessert wine.